The Zoho BugTracker Advanced Analytics Connector allows you to import Zoho BugTracker data and create insightful reports over them. With this integration, your Zoho BugTracker data can be easily analyzed to create insightful reports & dashboards using the powerful reporting options in Zoho Analytics. Also it enables you to proactively monitor & manage your BugTracker by tracking the Key BugTracker Metrics. What is Zoho BugTracker Advanced Analytics connector add-on and how does it work? Who can subscribe to the Zoho BugTracker connector add-on? What do I get when I subscribe to this add-on? How does the Zoho BugTracker connector add-on work? What are the default reports & dashboards created by Zoho Analytics, on setting up this connector add-on? How much does this add-on cost? Do you provide trial evaluation for this add-on? What do you mean by 'Users' in the (add-on) pricing plan? How do I purchase this add-on? How do I setup the Connector for my Zoho BugTracker account? How long should I wait for my Zoho BugTracker data to initially appear in Zoho Analytics? Can I edit the Zoho BugTracker connector add-on Synchronization setting? How can I view information details about data synchronization between Zoho BugTracker and Zoho Analytics? How to create my own reports with this add-on? What are the modules in Zoho BugTracker on which I could create reports using this add-on? On whose account will the Zoho BugTracker connector add-on be setup? Can I setup the in an account other than the one who configures/sets up the trial? Can I transfer my Zoho BugTracker connector add-on to another admin account? Can I modify the default reports that have been created by this connector add-on? If so, how? How do I create reports using Zoho Analytics with this add-on? [or] What are the reports that I can possibly make using this add-on? What are the default formulas added by Zoho Analytics, on setting up this add-on? Can I add/modify data in the Zoho BugTracker data tables (modules) from within Zoho Analytics? Can I add new columns to the Zoho BugTracker data tables (modules) from within Zoho Analytics? Can I combine data from other sources with the data from Zoho BugTracker to create reports and dashboards? Why are other members in my Portal not able to access the reports created? How can other members in my Portal create reports? What are the popular business applications that I can integrate Zoho BugTracker with? Will a relationship (lookup) be created between Zoho BugTracker and the third party applications that I integrate it with? How do I get technical support on Zoho Analytics add-on? Can I have someone from Zoho do a Demo of this add-on for me? Zoho Analytics is an on-demand reporting and business intelligence solution that helps you get new insights on your business information through its powerful and flexible online business intelligence engine. You get powerful reports in minutes, with no IT help. It offers the following important capabilities. Supports data import from variety sources such as local drive, web feed or cloud storage. You can import variety file formats including Excel, Open Office, CSV, TSV, HTML and JSON. Also supports periodic scheduling of import. Supports pulling data from various applications such as Zoho CRM, Zoho Projects, Zoho BugTracker, Google Drive, Dropbox, SkyDrive, Box etc., to provide advanced analytics over your data. Supports combining dataset to create reports. SQL (Structured Query Language) driven querying for powerful report creation. You could provide your SQL queries written in any of the familiar database dialects, including Oracle, SQL Server, IBM DB2, MySQL, PostgreSQL, Informix and ANSI SQL. Real-time collaboration by sharing data and reports in read or read-write modes with your colleagues and client. You could also notify reports via email. Supports accessing Zoho Analytics views and reports from iPad using a native application. 2. What is Zoho BugTracker Advanced Analytics connector add-on and how does it work? Zoho BugTracker Advanced Analytics Connector brings in all the capabilities of Zoho Analytics described above to Zoho BugTracker users. It comes with the following features/benefits. Create your own reports and dashboards based on not only your Zoho BugTracker data but also from any other data source (e.g., Excel spreadsheets, Zoho CRM, Google Adwords etc.,) that you would wish to combine with your BugTracker data. Collaboratively work with your colleagues when creating new reports/dashboards on your Zoho BugTracker data. Export your reports as PDF, HTML, Excel, CSV, JPG, PNG files to your desktop and print them for offline consumption. 3. Who can subscribe to the Zoho BugTracker connector add-on? Users with paid accounts of both Zoho BugTracker (Enterprise or Premium editions) and Zoho Analytics (atleast the Basic plan) can avail this connector. Note: Only Portal Owners or Admin users can configure this add-on to analyze their BugTracker data. As a Zoho BugTracker user this add-on brings you immense benefits. It enables you to do powerful analysis of your BugTracker data and create insightful reports & dashboards. This allows you to view your BugTracker data in ways you haven't looked at before. Zoho Analytics drag-and-drop based reporting is so easy to use that you could create any report or dashboard on your BugTracker data with no IT help or technical knowledge and share them to your colleagues. 5. How does the Zoho BugTracker connector add-on work? The Zoho BugTracker connector add-on for Zoho Analytics works as below. Zoho BugTracker Portal Owner or Admin user of the project chooses to configure this connector add-on in their Zoho BugTracker account. Selects the Portal and Projects from which the data is to be imported. Data from Bugs and Timesheet modules in the selected projects will be combined and imported into Zoho Analytics Workspace. Initial import will take some time. Data Import can be scheduled periodically from Zoho BugTracker, at the desired interval, to keep the latest data available in Zoho Analytics Workspace. By default 50+ insightful reports over the BugTracker data will be created. You can also easily create Custom reports over the BugTracker data. The Zoho BugTracker Owner or Admin, who setup the add-on can share the reports created in Zoho Analytics to other BugTracker users. 6. What are the default reports & dashboards created by Zoho Analytics, on setting up this connector add-on? When you setup/configure the Zoho BugTracker Integration Connector , 50+ default reports & dashboards are automatically created. These hand-picked reports will be pretty useful in analyzing your BugTracker data effectively. For example, Bugs Targeted vs Closed, Bugs status by Projects, Pending Bugs across Open Miestones and Projects and Top 10 Delayed Bugs. For more details about the reports supported by the Zoho Analytics Advanced Analytics for Zoho BugTracker refer to Reporting Features section. The pricing for the Zoho BugTracker Advanced Analytics Connector add-on starts at $15/month. This will enable you to import the data from Zoho BugTracker into Zoho Analytics, and avail the features in the Zoho Analytics free plan (2 users and 1,00,000 rows). This add-on is available free in all the paid plans of Zoho Analytics. Refer to the Zoho Analytics pricing page. Click the Subscriptionlink displayed in the top-right corner. A page displaying your current plan details will appear. You can subscribe to a paid plan by clicking the Upgrade button or on the Upgrade tab. Once you have decided on the plan,click theUpgrade button available below the corresponding plan. In the Plan and Charges page that opens you can choose the subscription interval (either yearly or monthly). The total cost of the plan based on the subscription interval will be displayed at the bottom. In the page that appears,enter the necessary credit card details, and click Make Payment. Note: Users with paid Zoho Bugtracker accounts (Premium or Enterprise editions only) can setup this add-on. Yes, we do provide a 15-day free trial for this add-on from the date of setup. Anyone to whom you privately share your databases, tables (data), reports and dashboards, created in Zoho Analytics, for collaboration is considered a "User" in Zoho Analytics. Users are identified by their unique email address, with which their Zoho Analytics account was created/registered. Let's say that you have subscribed to the Zoho Analytics Standard plan, you can privately share the data/reports in your account and collaborate with 4 other persons. Now, your Zoho Analytics account is said to have 5 users (including yourself). You can also purchase additional users and rows as required. Purchasing additional users is available only on paying plans. In Zoho Analytics, a row or record is defined in the same context as in a database (or spreadsheet). In simple terms, a table consists of rows (records) and columns (fields). Each row in a table represents a set of related data and has the same structure. For example, in a table that represents "Tasks", each row would represent a single task record. The number of rows calculated for pricing, is the sum of all rows/records stored across all your database tables in your Zoho Analytics account. 5. How do I purchase this add-on? 1. How do I setup the Connector for my Zoho BugTracker account? You can set up the Zoho BugTracker Connector add-on from Zoho Analytics user interface by following few simple steps. Follow the steps below to establish the connection from Zoho Analytics. Login to Zoho Analytics using the same Zoho BugTracker credentials. In the Home page, click Import from Zoho BugTracker option. The Import from Zoho BugTracker wizard appears. Specify a mandatory database name and an optional description. The Choose Zoho BugTracker Portal drop-down will list the portals for which you are an Owner or Admin. Select the portal from which you want to import data. All the Projects in the selected portal will be listed. Select required projects. You can select multiple projects. Relevant data from the selected multiple projects will be combined and imported into the corresponding data tables. Select the modules to be synced in the Modules option. The Bugs is a mandatory module. You will not be able to unselect this. In the Perform Import Every drop-down, select the schedule interval in which you want to import data from Zoho BugTracker. If you do not want to schedule an import select Not Scheduled from the drop-down. Initial data import will be started. This process will take some time. You will be notified at your e-mail address once this process is complete. Click OK. Note: You will be able to configure only one Workspace for each portal. 2. How long should I wait for my Zoho BugTracker data to initially appear in Zoho Analytics? You will not be able to view any data in this Workspace until the initial data import from Zoho BugTracker is completed. This will take some time depending on the amount of data available in your project.s You will be notified to your email address once this process is complete. The daily import/sync process of your Zoho BugTracker data can fail sometimes. And hence you may receive such mails occasionally. No worries. The Zoho Analytics team will look into it immediately and get back to you taking the required corrective action. Setup Process Failed mail will come when there is a failure during the initial Zoho BugTracker Analytics add-on setup. Synchronization Failed mail will come if there is any failure during the data synchronization process which runs daily, between Zoho BugTracker and Zoho Analytics, after the initial setup & import is completed successfully. If you have bought the connector over a free plan, you will be able to synchronize your data only once every day. If you are in a paid plan you can choose to synchronize your data at hourly intervals mentioned below. 5. Can I edit the Zoho BugTracker connector add-on Synchronization setting? Yes, you can edit the Zoho BugTracker connector add-on synchronization setting. In the Explorer tab, click Zoho BugTracker > Edit Setup. The Edit Zoho BugTracker Setup dialog will open. The Selected BugTracker field will list the projects that you have previously selected. Click Show All link to list all the projects in the Portal. Select or clear the checkboxes adjacent to the required projects. Select or clear the modules in the Modules option. Modify the synchronizing time in the Perform Import drop-down. In Every Import section, select the Import New Projects Automatically checkbox to import data from any new projects that you create in Zoho BugTracker portal, automatically into Zoho Analytics. Select Retain Archived Projects checkbox to retain the data from old projects, that you have archived in Zoho BugTracker, in Zoho Analytics. Subsequent synchronizations will take the above changes into consideration. 6. How can I view information details about data synchronization between Zoho BugTracker and Zoho Analytics? You can view detailed information about the data synchronization that happens between Zoho BugTracker and Zoho Analytics by following the steps given below. In the Explorer tab, click Zoho BugTracker. The Data Sources tab will open with the following details. BugTracker Schedule Every - Displays the schedule interval in which data will be imported. Data Sync Status - Displays the last data synchronization details. You can also view the synchronization status for each module by clicking More Details link. Next Fetch - Displays the next scheduled time to fetch the data from Zoho BugTracker. 7. How do I access the reports created in Zoho Analytics? Login to Zoho Analytics and access the Zoho BugTracker Workspace. You can view the Zoho BugTracker reports only when the initial data import/synchronization between Zoho BugTracker and Zoho Analytics is completed successfully. You can also create your own reports & dashboards, as required. Your other BugTracker users will be able to view these reports only when you explicitly share this to them. You can share these reports with fine grained permissions. 8. How to create my own reports with this add-on? You can easily create your own reports using the Zoho Analytics add-on by dragging and dropping the appropriate columns from the data tables (BugTracker module data) that have been shared with you. You can refer to the below presentation to know how to create your own reports & dashboards using Zoho Analytics. Note: For creating your own reports using this add-on, you can do it only if the administrator (or portal owner) who has setup this add-on, has shared the tables (that contains the Zoho BugTracker data) in Zoho Analytics to your account. Refer How to Share Reports & Dashboards question. 9. Who has access to the reports I create? By default, the reports you create are accessible only to you. However, you can share the reports with your colleagues using the 'Sharing' options available in Zoho Analytics. Refer How to Share Reports & Dashboards question. 10. What are the modules in Zoho BugTracker on which I could create reports using this add-on? Data from the following modules of Zoho BugTracker get synced with Zoho Analytics. The Timesheet is optional. You can choose to include or exclude this as needed. Each of the above modules data is stored as a 'Table' in Zoho Analytics. Default reports are based out of the above modules, which you have synchronized. You can also create your own reports & dashboards over the above modules. 11. On whose account will the Zoho BugTracker connector add-on be setup? It will be setup in the account of the Zoho BugTracker Portal Owner or Admin of the portal who configures this Connector add-on. It is this account which will serve as the master admin account of Zoho Analytics. 12. Can I setup the in an account other than the one who configures/sets up the trial? Yes, you can do this. If the account on which the trial was configured is not upgraded after trial expiry, then the account will be downgraded to free plan and eventually the sync will also be deleted. In this case you will be able to set up the synchronization in the account you need by purchasing the . You will not be able to trial the add-on again. 13. Can I transfer my Zoho BugTracker connector add-on to another admin account? At present, we do not provide an option in the user interface. If you require this transfer, please do mail us to support@zohoreports.com. We will get your requirements and handle this accordingly. 14. How can I remove the setup? In the Explorer tab, click Zoho Books button (or Data Sources button - in the case where the database contains multiple connector setups). 2. What are the default reports & dashboards created by Zoho Analytics, on setting up this connector add-on? 3. Can I modify the default reports that have been created by this connector add-on? If so, how? Yes, you can modify the default reports. If you are the 'Administrator' or a 'Workspace Administrator' of the Zoho Analytics account in which the Connector is configured (Refer Managing Users in Zoho Analytics). To modify the reports click the Edit Design button in a report's toolbar and you will be able to make the changes. If you are just a user who's been shared the report, save a copy of the report by clicking Save -> Save As. Now you can edit this newly copied report. 4. How do I create reports using Zoho Analytics with this add-on? [or] What are the reports that I can possibly make using this add-on? You can create any type of report with this Zoho Analytics add-on. All you have to do is open the appropriate table(s)/module(s) over which a report is to be created, click New and choose any type of report you would want to create. Use the intuitive drag-and-drop based designer of Zoho Analytics to create the report required. You can also quick view the type of reports & dashboard that are created by default, from the sample given below, to get know the possibilities. 5. How do I create reports using fields/columns across different modules? 7. What are the default formulas added by Zoho Analytics, on setting up this add-on? The following table consists of the defaults formulas in the Timesheet table. Returns the average billable hours by members. The following table consists of the defaults formulas in the Bugs table. Returns the scheduled duration (in days) to fix a bug. Returns the time taken (in days) to fix the bug if it is closed or will return the time between the start date to current date. "Time Taken" - "Planned Days"
Returns the delay (in days) to fix the bug. Returns whether the bugs is closed or not. Returns the time left to fix the bug. Returns the count of closed bugs. Returns the count of overdue bugs. Returns the percentage of overdue bugs. You can also add your own formulas to derive your own calculations. Do refer to Adding Formulas in Zoho Analytics help page. Refer to the Adding Formulas in Zoho Analytics help page. You can also read this blog post on aggregate formulas in Zoho Analytics. 9. Can I add/modify data in the Zoho BugTracker data tables (modules) from within Zoho Analytics? No, you cannot add or modify data in Zoho BugTracker data tables. Data from Zoho BugTracker modules gets automatically synched into Zoho Analytics in different tables (one table for one module). You cannot edit any of this data or add new data records from within Zoho Analytics. 10. Can I add new columns to the Zoho BugTracker data tables (modules) from within Zoho Analytics? Yes, you can add new data tables. 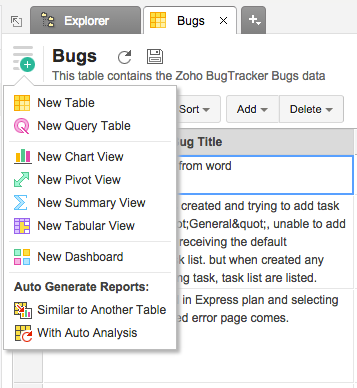 Click New > New Table to add a new table in the existing Zoho BugTracker Workspace. With this feature, you can import data from other sources or add them manually into your Workspace to analyze and create reports combining this with your Zoho BugTracker data. You can import data from files like CSV, Excel, HTML, JSON, Cloud Drives etc., or import data from local databases like Oracle, SQL Server, DB2, MySQL, PostgreSQL, MS Access etc., You can also use Zoho Analytics API to develop an application for data upload into Zoho Analytics. 12. Can I combine data from other sources with the data from Zoho BugTracker to create reports and dashboards? Yes, you can combine data from your other sources with your Zoho BugTracker data for analysis. To do this, you need to add/import a new data table into the Zoho BugTracker Workspace and then define a look-up to join it with the synchronized table from Zoho BugTracker. To define a lookup relationship between two tables, it is essential that the tables have at least one column which is common between them. Follow the below steps to look up a column from Zoho BugTracker along with the data from any other source. Zoho Analytics allow you to pull the data required by writing standard SQL SELET Queries. This is called Query Tables. With Query Tables you can also combine data from different tables and create reports over the same. Refer here to know about how to create Query Tables in Zoho Analytics. You can share the default reports provided in the Zoho BugTracker Connector add-on and the reports you have create, with other users in your portal. Refer to Sharing and Collaboration help page for more details on this. 1. If you share the data tables in the Zoho BugTracker Workspace to users, they will be able to create their own reports over the same. 2. If you add a user as a Workspace Administrator in the Zoho BugTracker Workspace created in Zoho Analytics (Refer Managing Users in Zoho Analytics, to know how to add Workspace Administrators), the user will be able access all the data & reports, create new reports and do any operation that you could do on the Workspace. 3. You can share data tables and reports to any user. They need not be a user in our portal. 2. Why are other members in my Portal not able to access the reports created? By default only the Portal Owner or Administrator who configures the Zoho BugTracker Connector will be able to access the views (tables, reports and dashboards) in Zoho Analytics. The Administrator has to explicitly share the view with other users. The shared user will be able to access the view with the specific permission that the Administrator has granted. Also when the Administrator has shared a table, then the shared users can create reports over them and these reports will be available only to them, until they share the reports with others. 3. How can other members in my Portal create reports? The Administrator (or Portal Owner) who configures the Zoho BugTracker Connector should share the data tables present in Zoho BugTracker Workspace with other members. Once this is done, the shared users can create reports based over these data tables. Note: If you add a user as a Workspace Administrator, then the user will be able access all the data & reports, and create new reports in the Workspace. A Workspace Administrator can to add, delete, and modify reports, table rows and tables. A Workspace Administrator can share the database tables/reports with other users. A Workspace Administrator cannot delete or rename a database. 1. Administrator (Master Admin): The Zoho BugTracker Portal Owner or Administrator who had setup the add-on will be the administrator of the Zoho Analytics account. 2. Workspace Administrator: The Administrator can designate one or more users as Workspace Administrators. A Workspace Administrator has all permissions to add, delete, and modify reports, table rows and even tables. A Workspace Administrator can share the database tables/reports with other users. A Workspace Administrator cannot delete or rename a database. Refer to Managing Users in Zoho Analytics, to know more about different user roles in Zoho Analytics. Also refer to Sharing and Collaboration help page. This is the expected behavior. Only when the users being shared is set as a Workspace Administrators, they can edit the reports. If a normal user wants to edit report, what he/she can do is to use Save As to save the report in a different name in his account. This report can then be edited. Yes, you can. Refer to the Sharing section to know how this can be done. Click Export this View > As PDF from the toolbar. The Export As PDF screen will open. Set the export setting as needed. Open the exported PDF and print it. Select Export -> Email this View from the toolbar. Follow the instructions in the screen and provide the required input to setup an email schedule. Select the Publish > Embed in Website/Blog option. By default, when you embed the report into your website, web application or blog, it would prompt users to log in with their Zoho credentials to access the embedded view. Also, users to whom you have shared the view (using the 'Share' option) would only be able to access the view embedded, on successful login. 2. How can I analyze the data from the other business applications along with Zoho BugTracker? 3. Will the related modules from Zoho BugTracker and other third-party application be created automatically? No, a lookup relationship will not be created between the Zoho BugTracker modules and the modules of the application that you are trying to import automatically. 1. How do I get technical support on Zoho Analytics add-on?